The smell of maple syrup reminds me of Christmas. Drizzled over salmon and baked, is a fantastic combination of flavours for a festive dinner. The fish is baked over a bed of spring onions, and served sprinkled with lemon zest for a wonderful, tangy flavour. One large salmon fillet, without skin, 1 ½ kg approx. In a small saucepan, put the maple syrup, ginger, 3 tablespoons of the lemon juice, soy sauce, garlic and salt and pepper. Bring to boil, lower the heat and let the mixture simmer for half an hour. Preheat oven to 175 C (350 F). Lightly oil a rimmed baking pan. 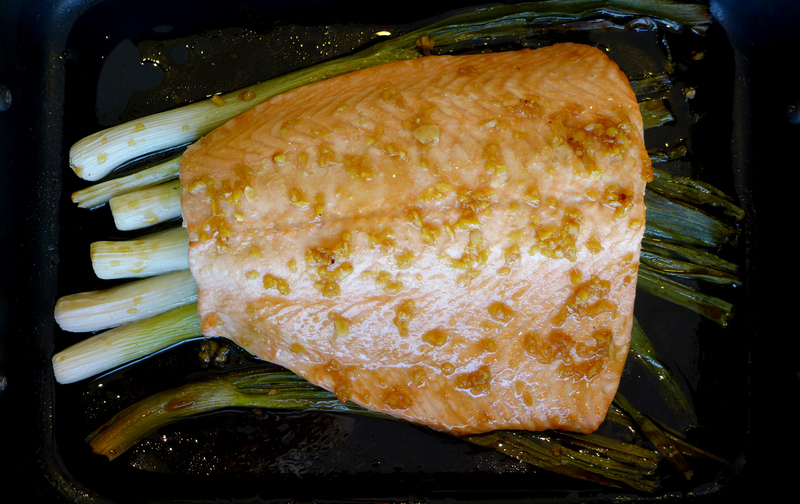 Put the spring onions in the pan and lay the salmon fillet on top, skin side down. With the help of a spoon, pour over half of the maple syrup sauce. Bake for 20 minutes. Let the salmon rest for 10 minutes, covered loosely with foil. Heat the remaining maple syrup sauce and mix in the remaining tablespoon of lemon juice. Sprinkle the lemon zest on the salmon and serve with the sauce.